This story represents a lesson and a metaphor for the conflict that we as humans face in our modern, fast paced world. We always end up finding the excuses that we are too busy or overwhelmed to slow ourselves down long enough to sharpen our axe. When you honestly think about it, what will one really achieve in not taking that time to sharpen their blade? We will not cut down that tree, and yet we will drain ourselves day after day while thinking we are accomplishing something. This is the problem that we face in our lives because we carry this attitude. As a metaphor, the tree represents the challenges that we face in life, and the axe represents our human refinement, discipline and intelligence. For us, as members and products of the “modern” societies and educational systems, it is important to understand that these “modern” systems are destroying our planet. The modern, industrialized systems project themselves as “developed”, “superior” or even the “leaders” over other cultures around the world. They are constantly attempting to solve the problems that we face as a species, but within their so called solutions, they end up creating more and more problems. So, we are facing many challenges in our modern times, and since our situation is only getting worse, this means that in our “modern” ways of functioning, we are lacking the discipline and intelligence to solve these problems (meaning our axe is dull). If we are seeking true solutions, then we must begin looking outside of our modern cultures. Because to continue to look to them for the solutions is comparable to an individual asking advice on how to cut down a tree from a man that has never been able to do it. This is where the Earth Center’s M’TAM School of Kemetic Philosophy and Spirituality becomes vital to humanity. The key to fixing our problems (sharpening our axe) lies in our education, and our modern education is not working because it only guides us on how to become employed by the system. But each individual, if they wish to survive on this planet, must be reeducated (initiated) into the principles that allow us to live in harmony with the Earth*. This is the job of the M’TAM initiation, which is open to everyone, but not everyone is ready to take on the challenges that it presents. The journey of initiation is a very formidable path, and though it is demanding, it comes with very positive results. One of the most challenging aspects of the initiation is that it comes in opposition to the way our modern society has conditioned us to look outside of ourselves for problems and their solutions. Initiation is opposite, it forces the individual to be honest with him/herself and look inward in order to face their personal weaknesses and corruptions as well as search within to find the discipline and motivation to bring forth solutions. In this article, we are celebrating a generation of M’TAM initiates that reached an important milestone within this initiation process that I am talking about. This important occasion is the graduation from the first level (Per Ankh) of the M’TAM initiation. Their graduation was held on the 29th of Kpekhan, 414 (June 6th, 2015). In this spiritual ceremony, they were given the generational name of Nimahat. The Nimahat generation originally started out with roughly 14 people. They endured a lot together on their path, but by the time they reached graduation, there were only 2 initiates left. We congratulate these Kemmiou (Kemetic people), Ibteni and Kemeera Nimahat, in remaining steadfast and persistent in their dedication towards reclaiming their Ancestral culture and spirituality. It is taught at the beginning of initiation that those you traverse initiation with will become your spiritual siblings. Kemeera Nimahat expressed that,”Ibteni and I have a very close relationship. We went from not knowing each other at the start, to being brother and sister.” This shows the beauty of the process of initiation where you face your challenges together with others. Those challenges faced by the group, and the effort put forth to overcoming them creates a bond that has the potential to last a lifetime. Both Ibteni and Kemeera completed the first level of all 3 classes of the M’TAM initiation: Medu Myeet (hieroglyphic language), Ka’at Ibi (meditation) and Sounnt (healing). 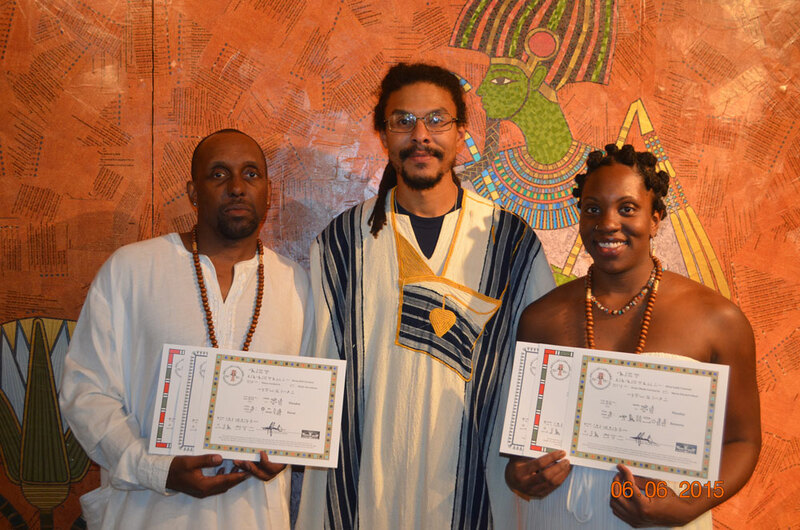 The focus of these three classes is to reeducate (initiate) the individual back into the paradigm of our Ancestors. In doing this, the initiate can once again become a preserver of life, rather than a destroyer. All three classes of the M’TAM initiation demand a lot of time, discipline, and humility, and that’s why it is understood that the path of initiation, the spiritual journey, is an uphill journey. As Kemetic people, our spirituality is what is most vital to us, so it is only natural that it calls upon all of our human qualities (strength, persistence, intelligence, etc.). The Nimahat generation faced these challenges with great courage and perseverance, always keeping the focus on their initiation. As they grew in their initiation they strengthened their service to their community in every capacity, and they continue to do so. 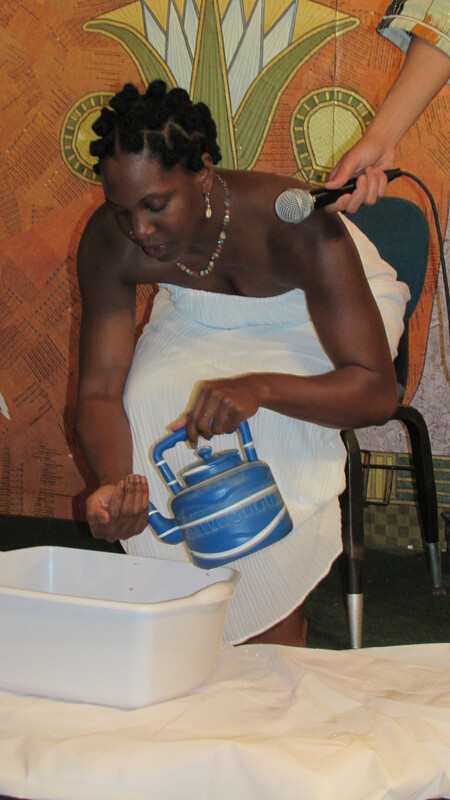 Kimeera Nimahat performs abulutions (spiritual purification) during the Kemetic graduation cememony. The sacredness of the landmark of graduation is that for Kemmiou (people of Kemet), we see this as one’s true birth into this life. Our first birth (by our parents) is what brings us into this world, but the birth of graduating from the Per Ankh (House of Life) is what signifies to the existence that we are now a “Kem”. “Kem” is the original word that our Ancestors referred to themselves as. “Kem”, in the medu (hieroglyphic) language, expresses the concept of “to search for and find”, and this refers to the obligation of the Kem to constantly search and find their perfect position and role in the becoming of the existence… an existence that is constantly transforming while under the control and maintenance of the Neteru (Gods). The names that were given during graduation have a very sacred and spiritual meaning. The names are not just made up or randomly chosen, but instead revealed by the Earth after oracles have consulted, interrogated and interpreted the energetic destiny of the initiates that are graduating. The destiny of each individual is deciphered, and then described in a word or words in the language of the Neteru (Gods), the Medu Neter. With these names comes a great responsibility because they reveal an understanding of these two individual’s essence and their purpose in this life. It was a long journey that took them 3 years, and we are very happy and proud to introduce and welcome Ibteni and Kemeera Nimahat into the worldwide Kem community. They have made the deepest commitment possible for a human being; a pledge to their personal transformation towards quality, and the preservation and enlightenment of humanity. We wish them continued courage and stability on their journey as they move forward in continuing their pursuit of reclaiming their Ancestral heritage. May Ancestors continue to put good things in your path, and may the Neteru give their approval.